Sometime in 2009, prompted by a section of The Artist’s Way, I made a list of ten things I wanted to do at some point. I’ve since lost the list but I remember that two of the things were learning some form of martial arts and taking up sewing. Fast forward to 2014. I enrolled in the Sewing Machine Essentials and Wiksten Tank classes at the workroom last month. As someone who doesn’t spend that much time in the west end of Toronto (I live near the Beach), I found out about the workroom in a roundabout way. I’d made a fun hat using a Wiksten pattern that I’d purchased through Ravelry. Wearing my Snöflinga hat whilst looking at dirty snow at the beach. Soon I found myself on the Wiksten Made website, where I came across the Wiksten Tank pattern. After a bunch of Googling and clicking I discovered Karyn’s blogpost about all the tanks she’d made using the pattern — and that Karyn ran the workroom. I signed up for classes and now I’ve pretty much quit knitting to sew stuff instead. My poor stash of yarn is languishing in a pile by the window like dried-up once-soggy ramen. I’ve sewed a bunch of things since. The first thing I sewed (during the class) was a cushion cover. My cushion is poufy and ugly. The first thing I ever sewed. Then I learned how to make zipper pouches on the Internet. Peggy Pointer zipper pouch using this zipper pouch tutorial from Pink Polka Dot Creations. Underwear Tiger zipper pouch using same tutorial as above. I made the patch thingy out of felt. Underwear Tiger zipper pouch using this Half-Circle Zippered Pouch tutorial from Lula Louise. Then I made a bunch of zipper pouches featuring a linocut print of my design — meet Commander Catfield and Félicette, the first cat in space! These will be for sale at Story Planet. Cats in Space pouches arranged in the shape of a STOP sign. 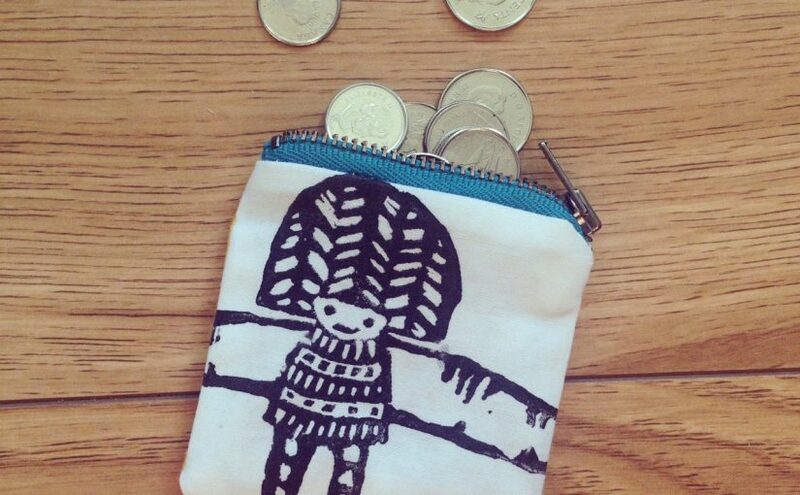 Assortment of random zipper pouches/coin purses. A post with all the Wiksten Tanks to come. I should probably warn you that I know nothing about buying fabric and I think I have no taste. You’ve been warned! Previous Previous post: peggy pointer pats a pony.